Paso Robles, Calif., August 28, 2017—Peoples’ Self-Help Housing (PSHH) began renovation on Los Robles Terrace on Aug. 15. Site-wide improvements to the affordable senior housing complex include expansion of the community room, fencing replacement, landscape updates, new exterior paint and installation of a new roof. Interior improvements of Los Robles Terrace will include new flooring, cabinetry, appliances, lighting and plumbing fixtures, as well as new paint throughout. Solar photovoltaic panel will be installed on the roof to generate electricity on-site and through installation of updated appliances, new windows, and air conditioning units the complex’s energy efficiency will increase by 12.6 percent. Renovations are scheduled to be completed by Christmas 2017. Built in 1991, the 40 Spanish-style apartments are located at 2940 Spring Street in Paso Robles. This 3-story complex provides housing for seniors 62 and older. The Los Robles Terrace renovation is funded by the County of San Luis Obispo (HOME), Wells Fargo Bank, the California Community Reinvestment Corporation, the National Equity Fund and a private donation. The U.S. Department of Housing and Urban Development (Section 202) housing assistance program ensures that residents of Los Robles Terrace will never have to pay more than 30 percent of their monthly income for rent. Founded in 1970, PSHH is an award winning non-profit organization that develops affordable housing and community facilities for low-income households and homeownership opportunities for working families and special needs populations, such as seniors, veterans, the disabled, and the formerly homeless. With nearly 1,200 self-help homes completed and nearly 1,800 rental units developed, PSHH is the largest affordable housing developer on the Central Coast, with offices in San Luis Obispo and Santa Barbara. 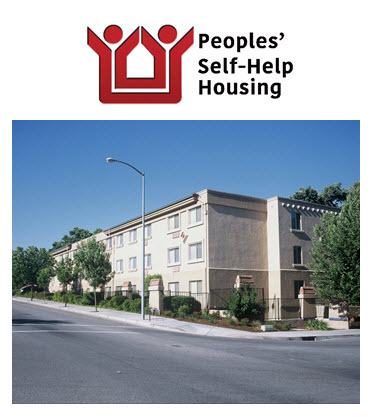 For more information about Peoples’ Self-Help Housing, visit www.pshhc.org, email communications@pshhc.org or call (805) 781-3088.